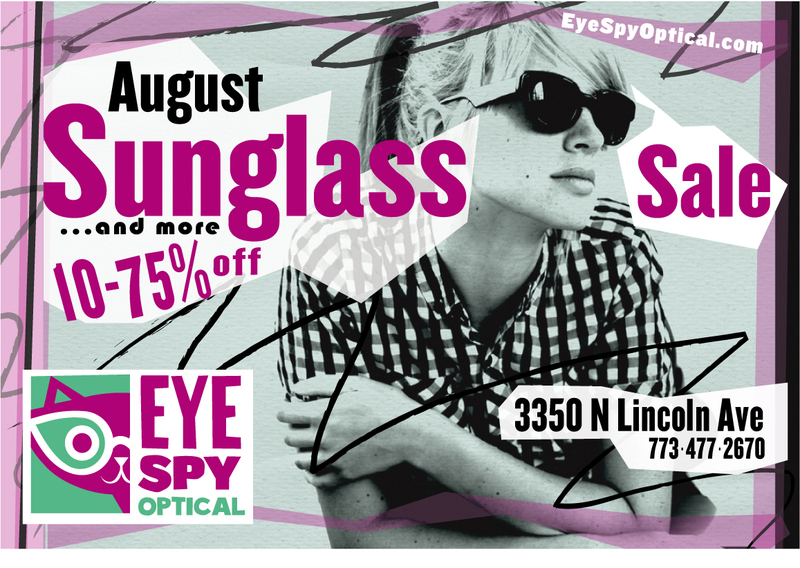 Come by Eye Spy Optical through the month of August for our MONTH-LONG sunglass sale! 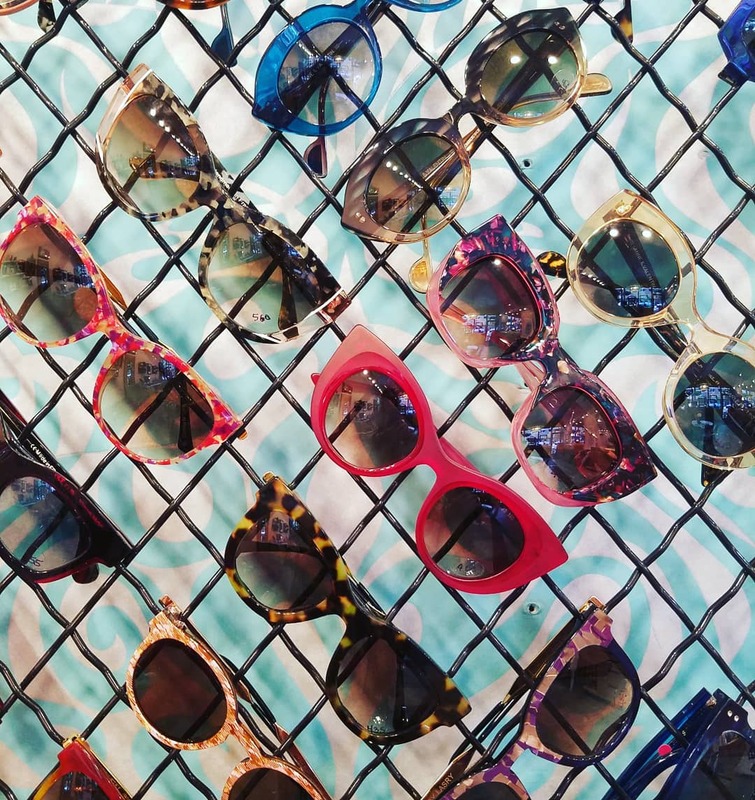 Once a year, we round up all of our sunglasses, and go overboard on the discounts! From the beginning to end of the month, take advantage of discounts from 10-75% off the retail prices of almost every pair of sunglasses in the store. All of our sunglasses can be purchased as-is…or we can make prescription lenses for any of our sunnies!! We are also discounting *select lines of eyeglasses* for the month…up to 75% off! So….stop by sooner rather than later to take your pick of hot sunwear before your favorite pair is gone!! Our AUGUST SUNGLASS SALE is on!! 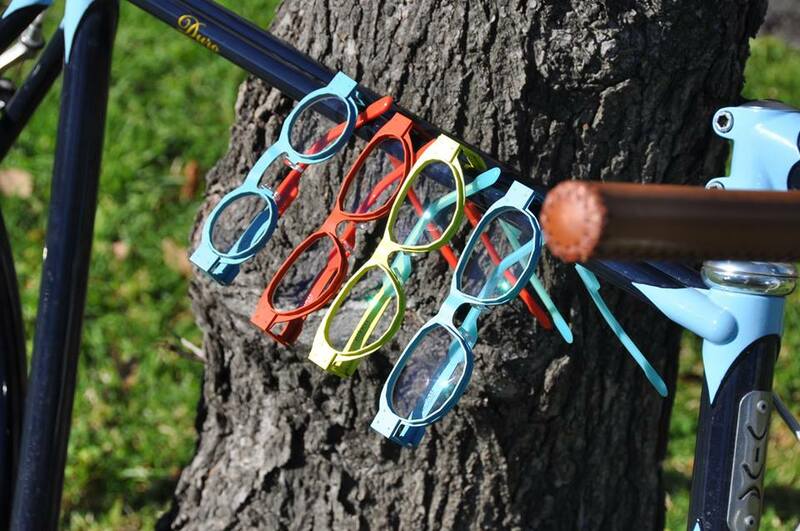 Once a year, we round up all of our sunglasses, and discount every pair! All sunglasses are on sale from the beginning to the very end of the month! 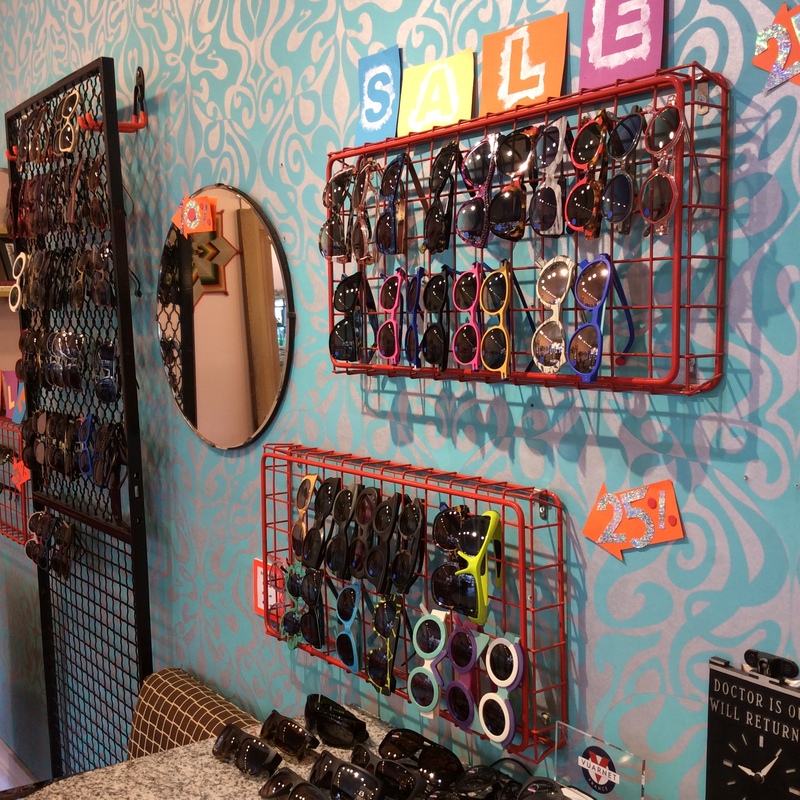 Come by and take advantage of discounts from 10-75% off of almost every pair of sunglasses in the store. Yowza! 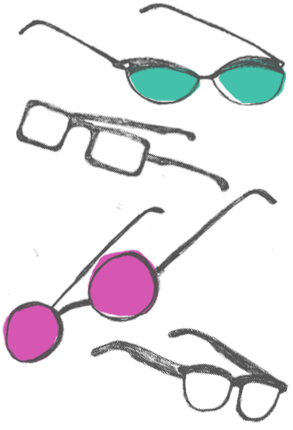 Just to add to the crazy of the sale, we have also put a a few of our eyeglasses lines on sale for 25% to 75% off! 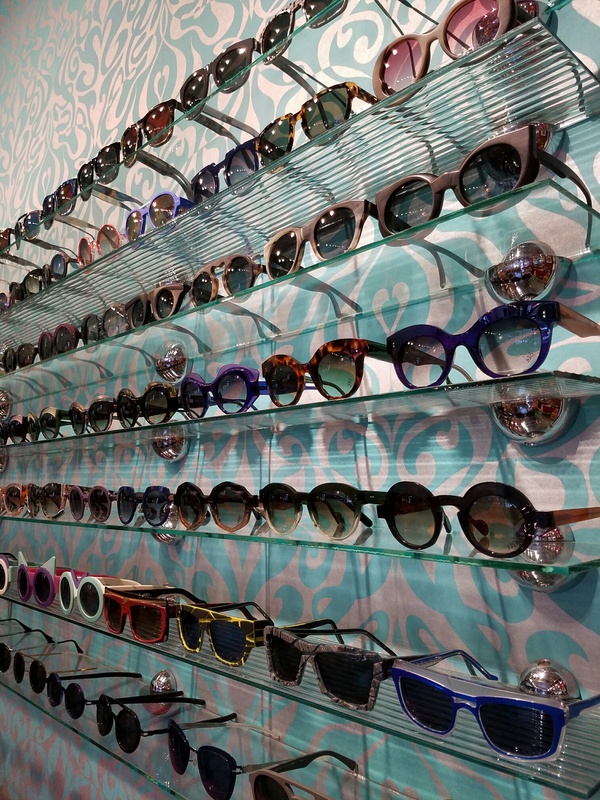 Come by and let us fit you with lovely sunnies to enjoy for the rest of the summer… and throughout the winter! We are getting ready for our AUGUST SUNGLASS SALE !! Once a year, we round up all of our sunglasses, and go a little bananas on the discounts. Yep, it is Customer of The Week time again. Wiggle your spirit fingers in the air for….Heather! Heather’s first visit to our store was a couple of January’s ago. 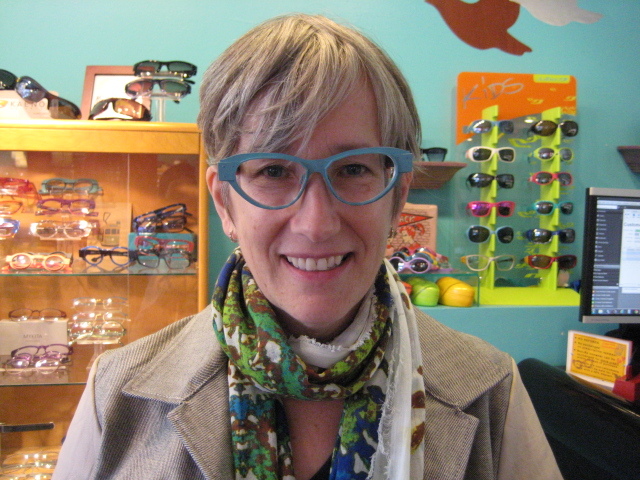 She drove all the way from Indianapolis, Indiana so she could look at our sale frames and was blown away by the amazing selection of fun and funky frames. From that moment on, she was a customer for life! She has made the pilgrimage to our shop a several times since (bringing friends!) and has collected a wardrobe of truly spectacular eyewear. On her most recent trip, she picked up a couple of gorgeous frames. Francis Klein Opera was part of our January sale, and called out to Heather the moment she opened the door. Sparkly crystals and silver studs are pretty hard to say no to, especially when paired with a flirty cat-eye shape. 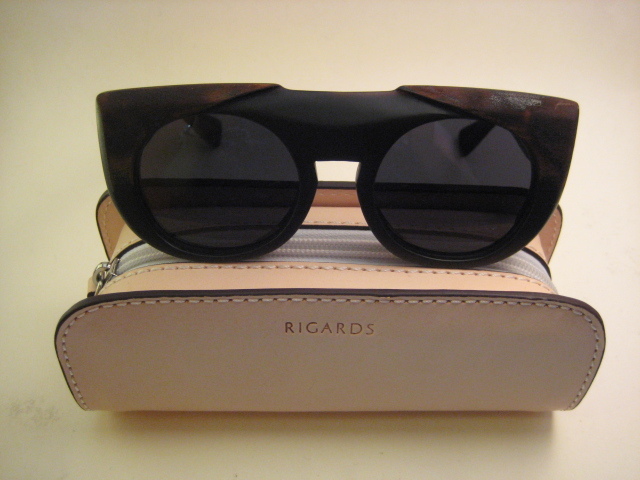 When she came in to pick up her Francis Klein, she fell in lust with a pair of striking Rigards buffalo horn sunglasses. But she decided she wanted to be able to wear them all day every day, and had us put clear lenses in them. We couldn’t love them more! 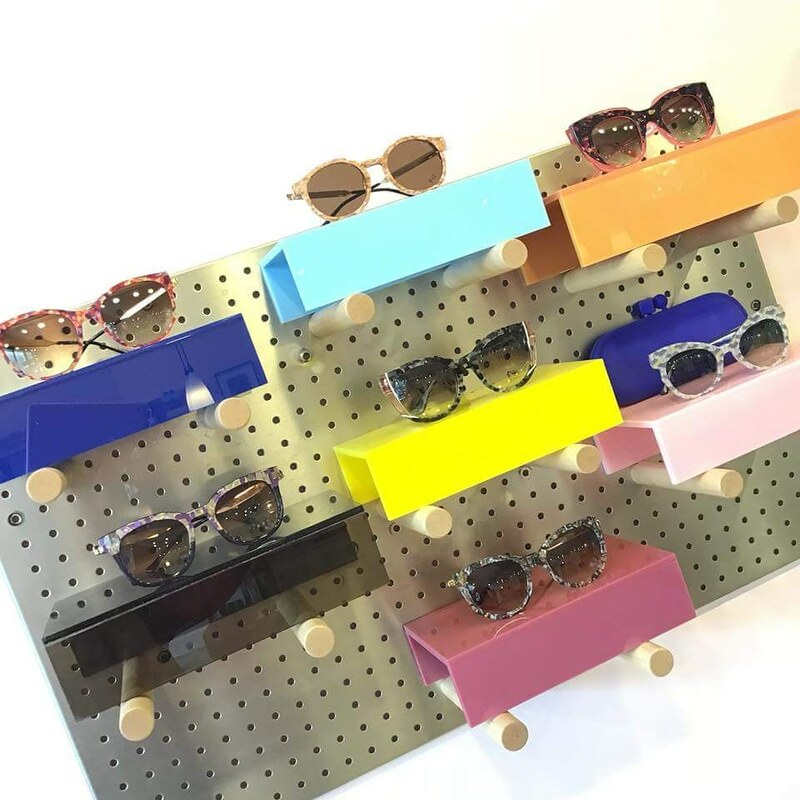 We love it when customers customize a frame – with a special color, or a special lens – and make the frame truly their own. We know, you are feeling a little jealous..but don’t worry, there are still plenty of cool specs left for you to take home! 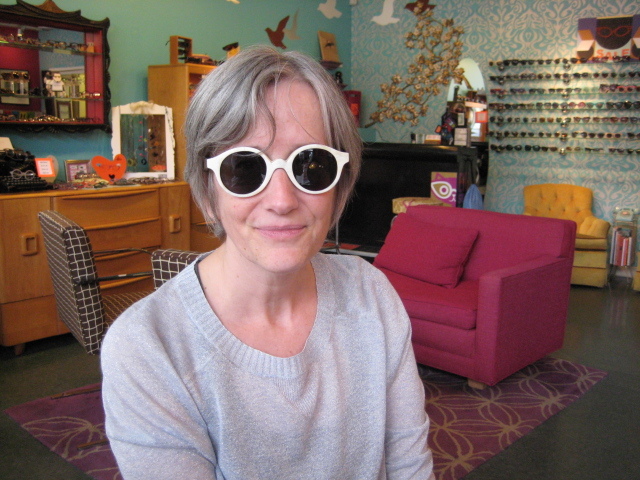 So, you might be thinking that Elspeth is our customer of the week because she bought three pairs of spectacular specs from Eye Spy, but you would be wrong. 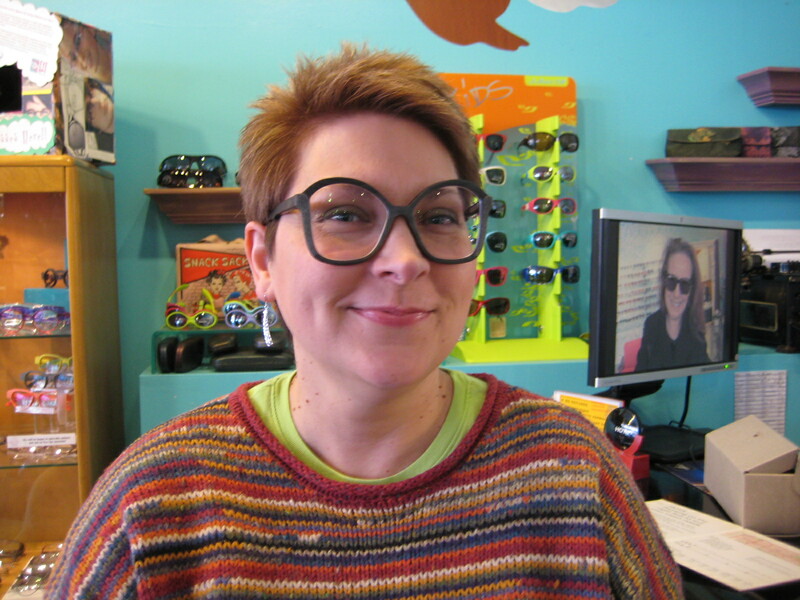 She is customer of the week because she looks amazing and totally different in all three pairs!! 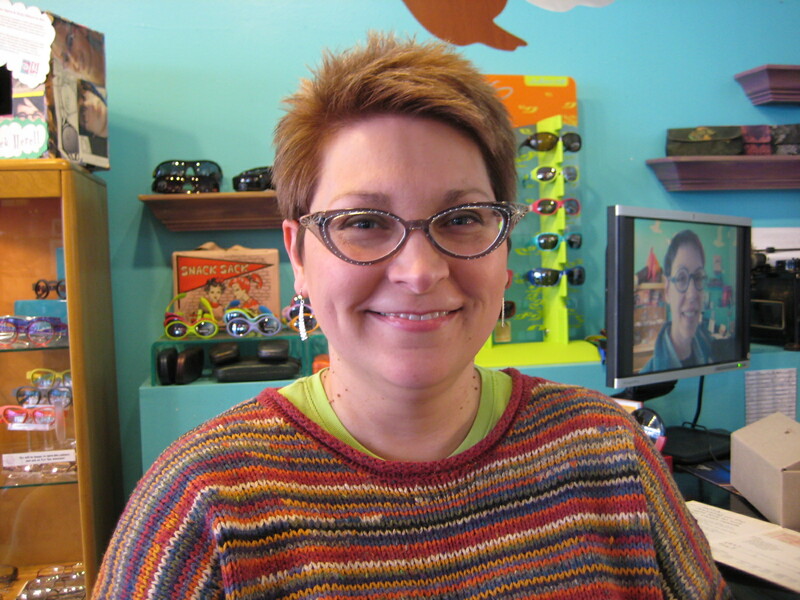 Sure enough every time Elspeth comes to find new frames, the Specs Wrangler just happens to be here! It’s like magic…or something close to it. They share their love of luscious leather boots and, of course, delectable glasses! After a process of elimination they settled on these three beauties. First up, we’ve got a powder blue Niloca Clockwork frame. The Specs Wrangler loved these so much, she ordered a pair for herself! Second on the dream series, she’s got an Anne et Valentin Modern Love! Lastly, Elspeth patiently waited for Rigards to come in, a brand new line to Eye Spy! 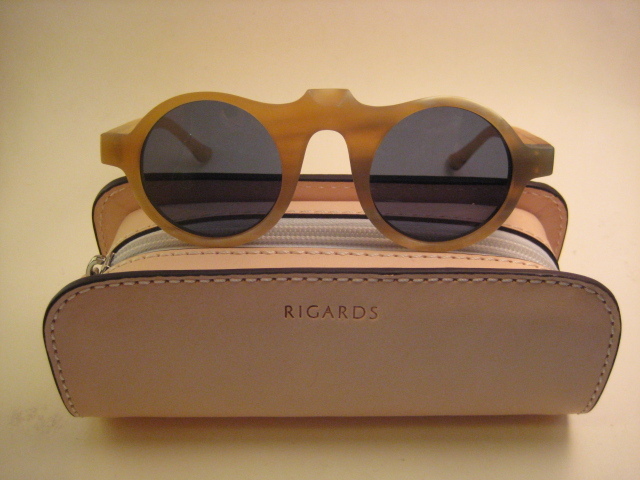 Rigards is made from sustainably harvested buffalo horn! What?! Each frame fits her like a dream. 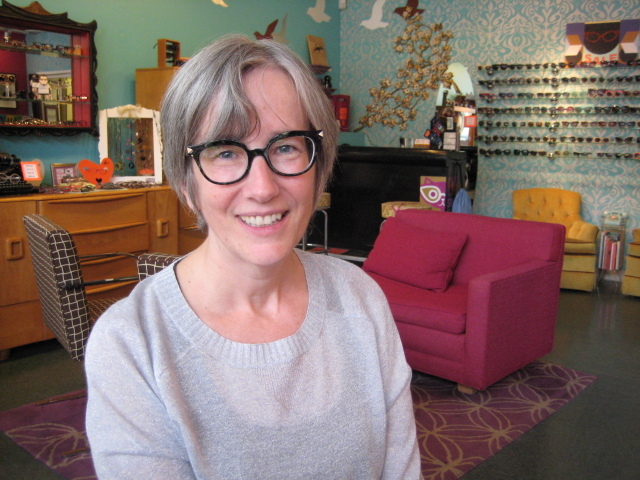 Hilariously, Patsy, the Specs Wrangler, also fits all the same frames!!!! Thanks for being perfectly lovely to work with Elspeth! You are a wonderful customer of the week! Drool-Worthy Buffalo Horn Sunnies have arrived. Where do we start the story of Rigards? En Paris, bien sur! Every year, the Queen of Specs travels to the fall eyewear show in Paris to discover new, tantalizing, eyewear that steals her heart. 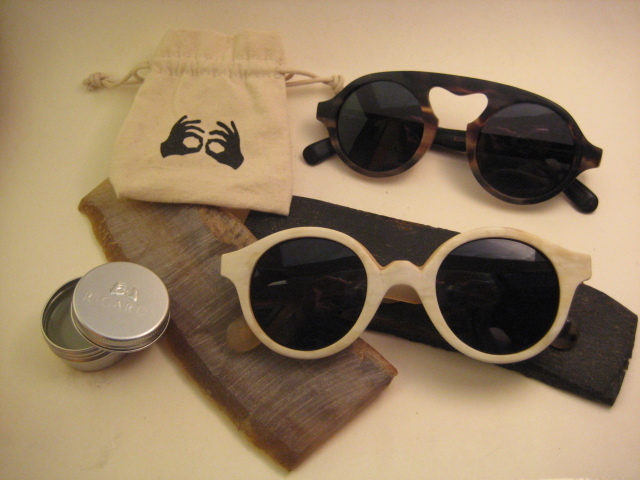 As you know, you cannot buy everything you want and love….but how could anyone say no to these buffalo horn sunglasses that are made-to-order?!? Impossible. BUT, since we waited until April and each pair is made-to-order, to our specifications of color & grain….we *just* received our order. It was worth the wait. 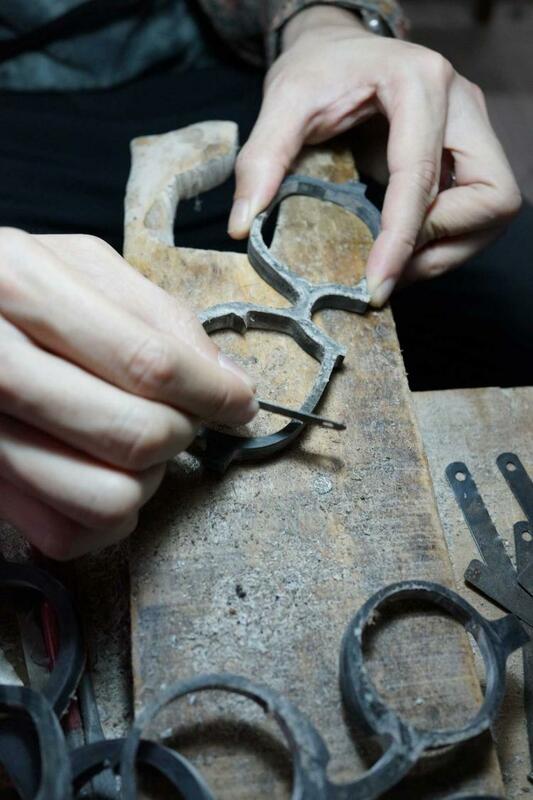 Every pair of frames is handcrafted with tremendous attention using time-honored methods of production and hand-finished with signature surface treatments, combining virtues of the past with modern sensibility. Both European and Asian fits are offered to provide maximum comfort for different face shapes. The buffalo horns used are an organic by-product of water buffalo rearing on small African farm. In addition, the horn is a sustainable natural material that is lightweight & biocompatible. Natural horn has the remarkable quality of adjusting to the skin temperature, allowing for an almost seamless feel. The pleasant warmth distinguishes horn from the standard manmade materials used in conventional eyewear and offers a sensual frame-wearing experience—a big plus for many luxury eyeglasses wearers. As a material of nature, horn has the extraordinary ability to age gracefully with use. The gradual evolution and organic patina embody the very characteristics cherished by selective eyeglasses owners. Sourced from sustained domesticated herds, the buffalo horns used have minimum negative impact on the environment. Leftover horn chips and shavings from the production process are recycled as fertilizers in agriculture. The humble horn wastes are actually a first-rate quality manure as horn is an excellent source of slow release nitrogen. As with all items of value, your horn frames need to be maintained to keep them looking their best. Horn is a durable product of nature and, if cared for correctly, can last for many years to come. So….stop by, try on a few pairs, and don’t be surprised when your hear skips a beat.